The orange oilcloth we stock has a real zing to it. Have a browse at all the different options and feel the lightening, uplifting effect it has just gazing over these wonderful, vibrant colours. Some say orange is not the only fruit but we’d happily live in a world where all tablecloths were bathed in this luminous shead. Imagine what an influence it would have on your room having any of these designs displayed on your tables. 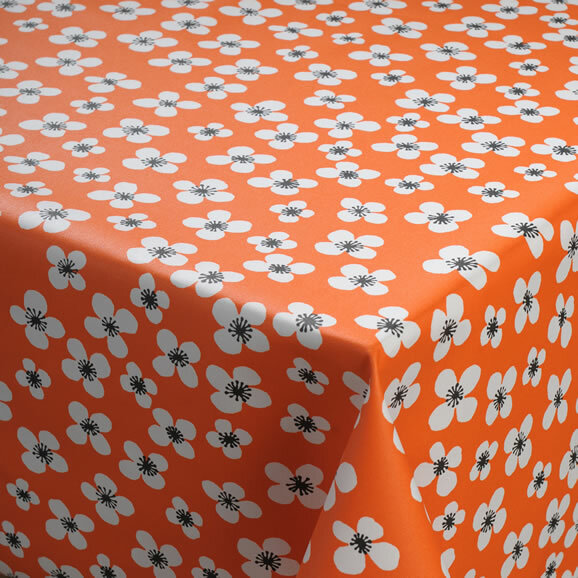 They combine the durability and practicality of oilcloth with the natural effervescent reaction orange brings. An Orla Kiely design that's floral, orange, linear and retro..............it's a winning combination. Multi-Coloured fish will always been a winning combination when it comes to style. Treat yourself to this classic Scandinavian Oilcloth design in stylish burnt orange. With a matte finish this is a stylish and practical Oilcloth Tablecloth. In cool grey with a orange stem, this iconic Orla Kiely Multi-Stem Oilcloth Tablecloth is a must for the fashion conscious. This burnt orange geometric nusa oilcloth is a perfect design for those looking for a stylish Wipe Clean Tablecloth. Get yours today whilst stocks last. Treat yourself to this incredibly on-trend burnt orange Zig Zags Chevrons Oilcloth.